This is a set of four buttons produced in 2013 by Ata-Boy for the DC Comics Originals brand. Each button is 1.25 inches in diameter and are of four characters: Superman, Batman, Wonder Woman, and The Flash from the New 52 continuity. April 4, 2017 in NOVELTY. 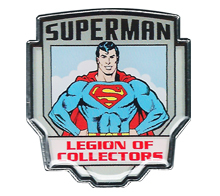 In 1988, DC Comics released this set of Superman pins. The set featured a history of Superman with four differently shaped pins with art by four artists: Joe Shuster, Curt Swan, John Byrne and Jerry Ordway. December 6, 2016 in NOVELTY. In addition to the phenomenal success of Pop! figures, Funko released as series of Pop! Pins. Here is a two pin set from 2015 that features Batman and Superman. November 1, 2016 in NOVELTY.